I have been a little critical of the “Baseball Entertainment Complex” lately. I am into nostalgia and I want to see more of the historic stadiums, and sometimes you are led to certain places. I am currently sitting in the press box of Bosse Field in Evansville, Indiana. This stadium is the third oldest stadium in operation behind only Fenway Park and Wrigley Field. I couldn’t believe my luck when I came into Evansville looking for a Starbucks so I could sit and write my blog for today. I couldn’t find a Starbucks but I found this place! It is the type of place I envisioned I would see all over the US when I began this journey! Bosse Field is most remembered for its role in the 1992 film “A League of Their Own”, starring Tom Hanks, Madonna, and Geena Davis, which tells a fictionalized account of the real-life All-American Girls Professional Baseball League of the 1940s and 50s. 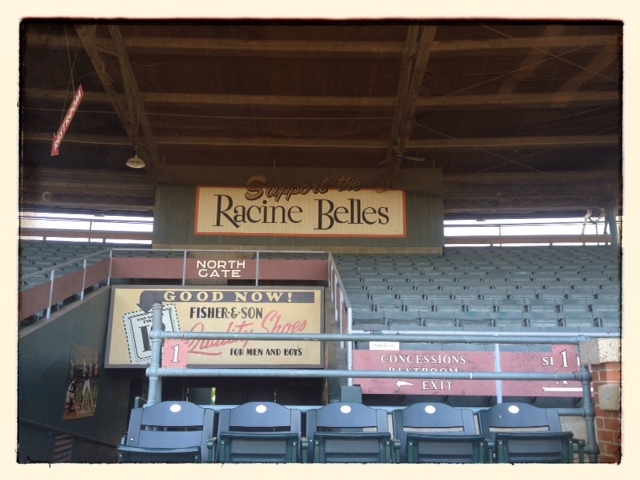 Bosse Field was the home field for the team in the movie, the Racine Belles, and the grandstand is still painted with their name. Major league players from Evansville include Don Mattingly and Andy Benes. Several Hall-Of-Famers called Bosse Field their home park early in their careers, including Warren Spahn and Hank Greenberg. Left over signage from the movie! I was just going to take a look at the park and then drive to Morganfield, Kentucky where I was scheduled to watch a high school game. When I arrived at the picturesque ballpark which is attached to the Garvin Park complex, I was stunned at how well it looked for how old it was. I walked in and started checking the place out like I owned it. 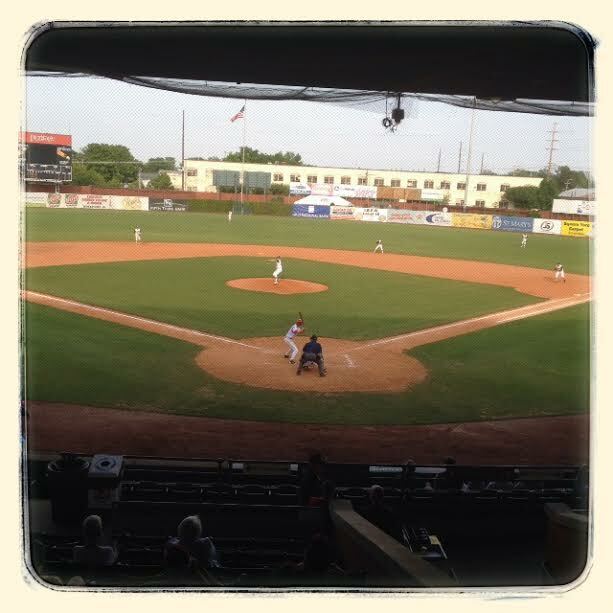 The Evansville Otters of the Frontier League utilize the front offices and play their games here. I talked with Jake Riffert, Director of Operations for the Otters. Jake game me a tour of the facility and a short historical overview. He explained that the stadium needs a lot of work but the Otters are on a limited budget, therefore can only do so much. 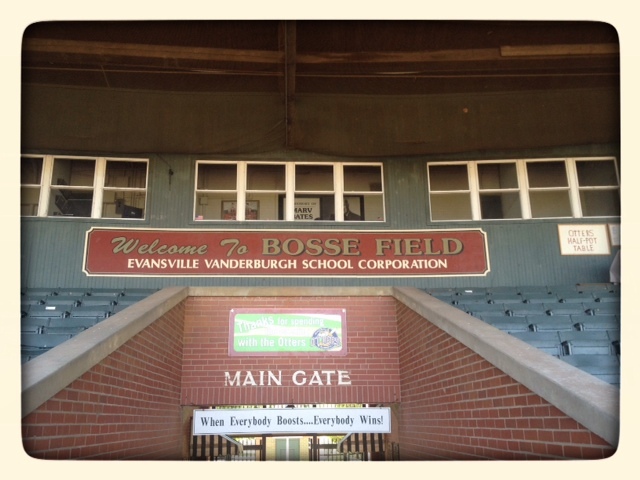 The stadium is owned by the Evansville Vanderburgh School Corporation (EVSC) which is a public school corporation serving Evansville, Indiana. At the moment, they don’t want to spend too much money on the place. I was so excited at what I was seeing I decided to stay for a high school game that was to begin at 4 pm. As I was walking back to my car to get my gear, I ran into some interns that were working with the Otters and helping get the stadium in shape for Opening Day this Thursday. One of the interns, Blake, walked me around the ballpark again. He had some great insights, also, and I appreciated the time he spent with me. He introduced me to the owner of the Otters Bill Bussing. He was gracious enough to talk to me for ten minutes as I told him how much I loved the place. I am currently full of ideas on what I would do to revitalize interest in baseball, assuming that people have lost interest in coming out to games. I told Bill some of my ideas, he probably thought I was nuts to come into his place and suggest certain things. Anyway I stayed for a fun game between Mater Dei High School and North High School both of Evansville. Mater Dei won the game, 7-3. I sat, watched and also “geeked” the game from the Press and Public Address Box where I spoke with recent Mater Dei High School graduate Chase Hoehn, who handled the PA duties. I was impressed with Chase and his calm demeanor. He was phenomenal at how he handled his job as he controlled the music in between innings and batters, also. He should go a long way! View from the Press Box! As I left Bosse Field, I couldn’t help but think about Historic Grayson Stadium in Savannah, Georgia and Carson Park in Eau Claire, Wisconsin. These places are a part of great baseball history and I think they need to be preserved. Early in my travels I did a piece on ASU baseball and that program moving to a different ballpark. My point in my post was you couldn’t move history. One of the reasons that baseball is our National Pastime is because its’ history aligns with a lot of our country’s history. People forget a ballpark’s ‘roots’ when they decide to tear down these old historic parks and build fancy new ones downtown that will look and feel old but have no history to them. Talk to any Red Sox fan, first thing they will ask is, “Have you been to Fenway?”, then you will see them drift off, their mind is at Fenway walking up the runway becoming awash in all of its’ historical glory. I want to say the same thing about Wrigley. I love that place. The fans are great but probably have a little more hard luck now days. I would love to work at a place like Bosse Field and build the historical fan base of this great game. I have met many people on this journey that have a passion for this game and all the idiosyncrasies. I believe in my heart that the older parks are unappreciated and there are many ways to reignite the passion for many of them. So many simple and overlooked ways. But, I am not going to bore you with what I would do if I were to own a team like the Otters that plays at a place with so much history, that is only for my daydreams for now!